The best city in Atlantic Canada is something to behold. From the history at Citadel Hill, the view at Peggy’s Cove or hosting the annual Busker’s festival; Halifax offers what every tourist expects in a visit. What most tourists and other Canadians are probably not aware of, is the fact that Halifax has more pubs/bars per capita then anywhere else in Canada. 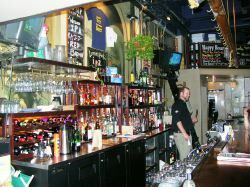 These pubs are joined by Halifax’s two functioning brew pubs; Granite Brewery on Barrington Street (sister location to the Toronto establishment) and Rogue’s Roost on Spring Garden. Halifax also has two outstanding microbreweries in Propeller and Garrison’s with sales that continue to soar. 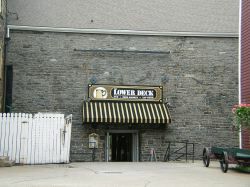 John Shippey’s craft beer was once a brew pub at the harbourfront market but is now brewed at the Propeller brewery and served at The Split Crow Pub on Granville Street. 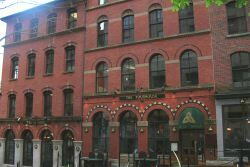 From the huge selection of 60 draught beers available at Maxwell’s Plum, the smell of fermenting beer at Rogues, the rich atmosphere at the Halifax Alehouse, to the Henry House’s darkened drink room; this city, steeped in historical themes, is a true beer lover’s paradise. The micro-breweries offer drinkers more choice than the traditional maritime beers like Keith’s or Oland and happy hours keep drinkers satisfied in the late afternoons. 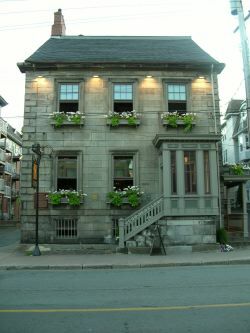 The Granite is no longer situated in the Henry House, but has taken up permanent residence at 1662 Barrington Street. 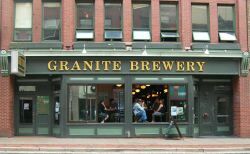 The Granite Brewery offers 5 English-style ales that have been brewed on site. They are top-fermented, unpasturized ales which are brewed with all natural ingredients. Extra Special Bitter, Peculiar, IPA and more are on tap along with local draught. A Summer Organic Ale is presently being served for the curious beer drinker. The setting in the Granite has a traditional English pub feel with its dimmed lighting and old wooden furniture. A nice mirror overlooks the long slender bar and adult contemporary music lingers in the background. The open windows let drinkers watch the movement of the busy city go by or you can sit in the back and read a book. Memorabilia like glassware, t-shirts etc is also available. “Just try the damn beer” is the motto that the knowledgeable servers at Rogue’s Roost live by as they strive to get visitors to experiment with beer selection. Located at the busy intersection of Spring Garden and Queen Street, Rogue’s brew pub has been serving Haligonians for years. The Roost offers Rogue’s Red, Bulldog Brown, Raspberry Wheat, Cream Ale, Oatmeal Stout, India Pale Ale on a regular basis and serves seasonal that brews include Peated Porter, Pale, Barley Wine and Imperial Stout. The Rogue offers a great window seat overlooking the movement of people on Spring Garden, or have a closer look at the people traffic while sitting outside on their patio. But the best seat is near the bar looking to the right at the beer vats through large windows and visualizing the brewing process. Award winning Propeller Brewery was created on John Allen’s desire to consume quality beer and with the help of friends and family he opened the doors to his establishment in 1997. Propeller brews four year round beers; Pale Ale, Extra Special Bitter, London Porter and Honey Wheat and has just recently released a 6.5% IPA. 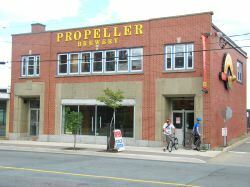 Propeller has the honour of being named “best microbrewery 2006” in Halifax beating out Garrison’s and Rogue’s Roost by the readers of The Coast newspaper. Located on Gottinen Street in the North end of Halifax, Propeller offers tours, taste tastings and a cold beer store that offers clothing, six packs, growlers and more. Gather a group of 10 or more people and pay $15 to take a tour and learn all about the beer. Recently, Garrison has taken up new digs in at 1149 Marginal Road across from the infamous Pier 21 Historic site. 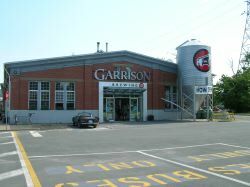 Launched in 1997 with “Irish Red Ale”, Garrison success has since led to the creation of four year round ales; Nut Brown Ale (a 3 star rating by Stephen Beaumont), Tall Ship Amber Ale, and Raspberry Wheat Ale with one winter and two specialty beers. One is Jalape–o, a spicy yet sweet beer. The doors at Garrison are always open for visitors to come in and have a look around. Singles or growlers along with t-shirts and glassware are available from the beer store. A minimum of 20 people is needed to partake in a brewery tour. But, if you manage to join a group, you will be shown a fabulous time. You are provided with the knowledge of pouring the perfect pint, learning how the brewery got started and of course, trying the beer. 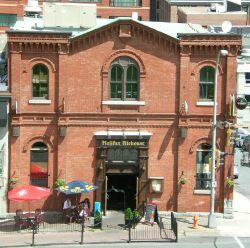 The Halifax Alehouse is located on Brunswick Street down the road from the Halifax Metro Centre. The focus is on providing customers with a great beer experience while they enjoy the sight of servers dressed in 1800’s style uniforms. The Alehouse boasts knowledgeable servers and a draught room where all the beer is pushed out of the kegs by “beer gas”, giving the beer drinker a true taste of this great beverage. Customers have the opportunity to have a look at the keg room and see how the Alehouse pride’s itself in serving great beer. The furniture in the Alehouse is comprised of old oak beer barrels with tops that serve as tables and many bottles of beer from around the world are incased and on display. Beers from Belgium, Ireland, Canada and the USA make up the list for what’s on tap and you can choose a bottled beer from England, Canada, USA, Scotland, Germany, Mexico and the Netherlands. Check out their colourful beer menu and read interesting facts and quotes regarding the greatest drink on earth. 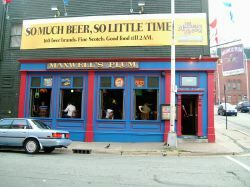 Maxwell’s claim to fame in Halifax is their statement of having more beer on tap than anywhere else in Eastern Canada, with up to 60 selections. Free peanuts and a traditional pub setting go along with a great happy hour where you can get a delicious Pumphouse Blueberry Ale. Maxwell’s bar is open till 2am along with the kitchen seven days a week offering drinkers the best of both worlds. The beer selection includes local draught like Propeller, Garrison’s, and Pumphouse, with European imports and other Canadian micro-brews. On a side note, the Plum is one of only three places in Halifax that offers McAuslan St. Ambroise Oatmeal Stout on tap. 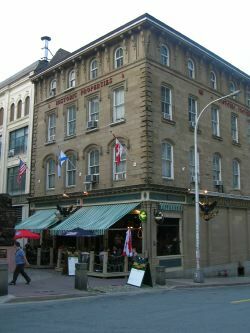 Other pubs to check out for good times but don’t necessarily sell premium hand crafted brews are; The Red Stag in Keith’s brewery, Victory Arms pub, Tug’s Pub, Pogue Fado on Barrington and Gus Pub in Halifax’s north end. CHEERS! !